With many people in the U.S., and indeed the world, still shocked at the outcome of the recent presidential elections a certain amount of buyer’s regret only seems a natural response. However, Presidents are not in any way similar to the faulty Christmas lights you can return to the nervous wreck of a clerk who just survived Black Friday at Walmart for a full refund. Unfortunately, for those wishing to return a potentially faulty President, you may be stuck with him for the next four years. All hope is not lost, though. The slightly older readers will remember a certain President Clinton who became the second president in U.S. history to be impeached. The first being Andrew Johnson the 17th President who followed Lincoln. How then does one go about impeaching a sitting president? Sadly, it has nothing to do with peaches or peach pie. Rather it is a process that involves both houses of the United States Congress that are in all likelihood devoid of tasty peach treats. A large portion of this article will be dedicated to the process of impeachment and those unlucky few who were impeached whether deservedly or not. Lastly, I will investigate whether there are other methods available to the outraged public to get rid, peacefully, of an elected official. Spoiler alert, if you were hoping to depose the current President via legal methods you will be disappointed. The right to impeach public officials is guaranteed in the U.S. Constitution. Article I, Sections 2 and 3 set out the reasons required while Article II, Section 4 deals with the process to be followed (Brunner 2017). From those above-mentioned articles, it appears that a president of public official “…shall be removed in Impeachment for, and Conviction of, Treason, Bribery or other High Crimes and Misdemeanours.” (U.S. Const. Article II, Section 4). The American Process can be seen as a borrowing of the British Parliamentary process (Loftgren 1998). The British Parliament developed the process to exercise some sort of control over the King. Parliament could not directly impeach the King as it was seen as his rule was divinely inspired, meaning he was chosen by God to rule and kicking him off the throne would most definitely be tempting fate. Rather, Parliament could bring to account ministers and other public office bearers who were seen as the Kings favorite and instrumental in seeing the King’s will be done. This form of impeachment came to define struggle between the King and Parliament for the limits of power. Things would eventually come to a head, excuse the terrible pun when Charles I was executed in 1649 by Oliver Cromwell and the newly formed Commonwealth (Loftgren 1998). Prior to this many of the Kings favored ministers were impeached by parliament to try to curtail the absolutist power King Charles wielded as well as those that tried in a variety of cunning ways to subvert the power of Parliament. The oddly phrased “High Crimes and Misdemeanours” in the U.S Constitution is taken directly from the British parliamentary rules that govern their impeachment process. All of the sixteen, now infamous officials, who have been impeached in the U.S can be broadly put into three categories of behavior where impeachment is appropriate. Those categories being “(1) exceeding the constitutional bounds of the powers of the office in derogation of the powers of another branch of government; (2) behaving in a manner grossly incompatible with the proper function and purpose of the office; and (3) employing the power of the office for an improper purpose or gain.” (Loftgren 1998). Each of these categories will be looked at in turn. President Johnson’s impeachment rested on allegations he had exceeded his powers in office. Historically, though, it is seen as a result of a bitter bipartisan struggle between Democrats and Republicans due to the reconstruction of the South after the Civil War. Briefly, Johnson was charged with violating the Tenure of Office Act, which essentially took away the President’s authority to remove members of his cabinet. The catalyst this impeachment was Johnson removing his Secretary of War Edwin M. Stanton (Loftgren 1998). Since this event, Congress has enacted laws to prevent against the impeachment of office bearers for political reasons. For Judge John Pickering his propensity to drink on the job to the point where he was visibly intoxicated was seen as a violation of his trust and duty as a judge. He had even used profane language, according to minutes of the hearing, while intoxicated on the bench and was subsequently described as “being of loose morals and intemperate habits.” (Loftgren 1998). This was enough, and rightly so, to ensure that his gavel swinging days were over. In another case, Associate Supreme Court Justice Samuel Chase was impeached in 1804 for allowing his partisan views from influencing his decisions in two trials. Thankfully, there are measures to deal with biased and drunk judges. For those not wanting to see four years of President Trump, this may be your best argument for impeachment. If we look at Trump’s unwillingness to place his business empire into a blind trust could open himself up to the dreaded liberal media from asking uncomfortable questions as to the nature of his business dealings. If he were to then to unjustly punish those irritating journalists then this ace up the sleeve is in play. Historically, Judge George W. English was impeached in 1926 for threatening to jail a newspaper editor for a critical editorial piece. In order to successfully impeach a public official, including a sitting president, a formal accusation or impeachment needs to be brought before the House of Representatives. In order for it to be successful, it will need to receive a simple majority in the vote. Then it is moved to the Senate for trial and conviction. In order to secure a conviction, it needs a two-thirds majority in the vote. Interesting none of the impeached presidents have been convicted. Unfortunately for those in America cursing the Democratic and by default the Electoral College system your options to say “You’re fired!” are limited. In South Africa the Constitution allows for parliament to issue a motion of no confidence or the ruling party may recall the President. Recall is not an option in the U.S at federal level as the Constitution does not currently provide for it (Murse 2017). In a few states, they have state law that provides for the recall of public officials. All hope is not lost for those wishing to depose a president using legal, and more importantly peaceful means, there are two further provisions in the U.S. Constitution. That being said, the chances of these actually working is about the same as getting your local witchdoctor to conjure up a potion to be rid of a sitting president. These are the emoluments clause and the disability clause. An emolument, for those too lazy to reach for a dictionary, is “…a salary, fee, or profit from employment or office.” (Brooks Spector 2017). The clause states “No Title of Nobility shall be granted by the United States: And no Person holding any Office of Profit or Trust under them [the United States], shall, without the Consent of the Congress, accept of any present, Emolument, Office, or Title, of any kind whatever, from any King, Prince, or foreign State.” (U.S. Const. Article I). In order to pull this animal out of a uniquely magic hat, you would need to prove that the Presidents business dealings benefited and influenced a foreign government to the point it would interfere with U.S. independence. The disability clause states “Whenever the Vice President and a majority of either the principal officers of the executive departments or of such other body as Congress may by law provide, transmit to the President pro tempore of the Senate and the Speaker of the House of Representatives their written declaration that the President is unable to discharge the powers and duties of his office, the Vice-President shall immediately assume the powers and duties of the office as Acting President.” (U.S. Const. Section 4). 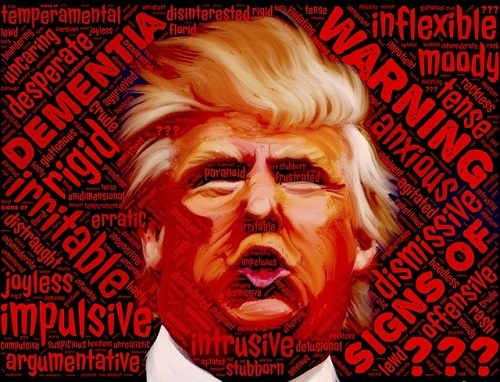 Good luck getting the current President declared unfit to serve as president whether mentally or physically with Republicans holding the majority I both houses and strong allies been named in his cabinet. Unless the current president truly does something to trump all his past “shocking” moments it looks like America is stuck with him. Christopher Bates. "Difference between Impeach, Veto, or Recall of a President." DifferenceBetween.net. February 1, 2017 < http://www.differencebetween.net/miscellaneous/how-do-you-legally-fire-a-president/ >. Why do you have President Trumps picture on this article? Oh wait , I guess you think this pertains to him. Better think again Sore Loser! Thank you for such an explanation in impeachment processes. People Power has been successful in the past for other countries. I don’t know what has happened to Americans (ex. the other comment here). They attack with vengeance and name-calling, which is a product of the President’s influences. I had hoped to see more educated responses. Your article enlightened me to difficulties we face as a nation, and you’re right…looks like we may be stuck with him. Thank you again.